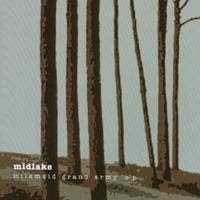 Midlake will be here in Sydney in six days, very excited about that, now on top of that i was happy to hear the 2001 EP Milkmaid Grand Army recently. Self released and only selling 1000 copies, it now sees the light of day after the band's success in the past couple of years. Closer to the eccentricity of "Bamnan and Slivercork" then the lush sounds of "The Trials of Van Occupanther" it nonetheless shows off the prodigious talent of the Denton, Texas pop masters. Here is the first track off the re-release. MP3: She Removes Her Spiral Hair. 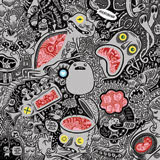 A record to have the pulses racing in early 2007 will surely be the Barsuk debut of Portland experimental trio Menomena. Their 2004 release "I am the Fun Blame Monster" was a hidden gem of unique sounds. "Friend and Foe" looks to see the band continue their growth judging by the first track to get a public airing, Wet and Rusting. Also how cool is the artwork by Craig Thompson.